This year in sunny Anaheim, California, the NAMM show once again had a fantastic display of beautiful pianos. From inexpensive to opulent, there are pianos for everyone to see and enjoy. Present this year (in alphabetical order of brand): Baldwin, Bluthner, Bösendorfer, Brodmann, Emerson, Fazioli, Geyer, Grotrian, Hailun, Hallet Davis, Hardman, Irmler, Kawai, Kayserburg, Knabe, Mason & Hamlin, Mendelssohn, Niendorf, Pearl River, Perzina, Ravenscroft, Ritmuller, Samick, Sauter, Schimmel, Schulze Pollmann, Schumann, Seiler, Wilh. Steinberg, Steinway, Weber, Yamaha and Young Chang. 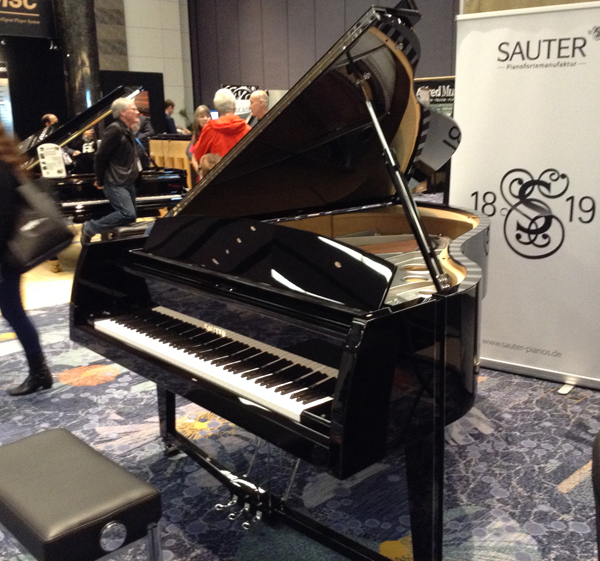 In the eye candy department, there were incredibly artistic grand pianos from both Sauter and Fazioli. And these spectacular instruments are as beautiful to play as they are to look at. 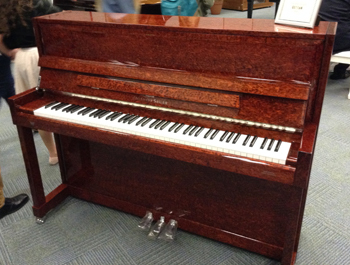 Speaking of cosmetics, Samick displayed a bird’s eye maple red Johannes Seiler piano which was visually striking. And where credit is due, again, Sauter’s upright took the prize for fashion statement, designed by Peter Maly. Both Steinway and Grotrian companies presented satin pianos with high gloss fallboards. The contrast is beautiful. Grotrian’s textured matt finish is a welcome alternative to the myriad of gloss finishes today. New at the show this year was a company called Niendorf – a re-established name and company located in Germany. The Schumann piano line (formerly part of Sejung and later Welkin Sound) also was released under new American ownership and distribution. 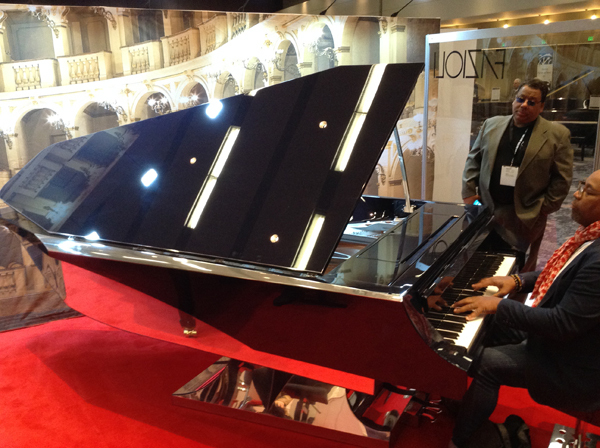 Hailun Piano debuted their first Emerson grand piano – soon to be released as a full line of pianos this year. Pearl River has expanded their upper end piano line Kayserburg with several new models and have included Renner options. Grotrian, in 2017 debuted Friedrich Grotrian, a piano line whose frame, cabinet and strings are built in China and then finished in Germany. This year, they displayed Wilhelm Grotrian, a piano completely made with Grotrian specifications in China. An aside: Grotrian has the coolest slow-close “button” fallboard in the industry. Similarly, Wilhelm Steinberg has followed suit with instruments built in Germany and separate models built in China but also with Renner options. In technology as it relates to pianos, QRS unveiled a tiny but incredibly powerful device simply called Connect which allows you to record, upload to a cloud and connect for purposes of teaching evaluation or collaboration. 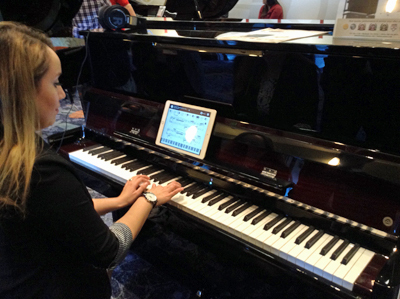 Hailun presented their first iPiano with interactivity. Connected by bluetooth, the piano features teaching tools and exercises in hopes that there’s more BOB effect… I have to admit, I hadn’t heard of it either… it stands for Butts On Benches. In other words, the hope is that with technology, kids will experiment, will play and engage with the piano and spend more time on the bench. In other news, Pearl River is finishing their expansion to complete the largest piano factory in the world, exceeding 140,000 pianos annually. ETA will hopefully be some time in May. Boutique maker, Ravenscroft is also forging ahead with new plans but I’m sworn to secrecy 🙂 This year, the Piano Technician’s Guild (PTG) also displayed historic pianos and tools as well. At first glance, the Chickering piano on the right seemed like just another old piano until Shawn Bruce of the PTG told me to read the historic significance. It was the piano on stage present at the Ford Theatre when Lincoln was assassinated. Incredible. Steinway, Story & Clark (QRS) as well as Yamaha presented digital player pianos. 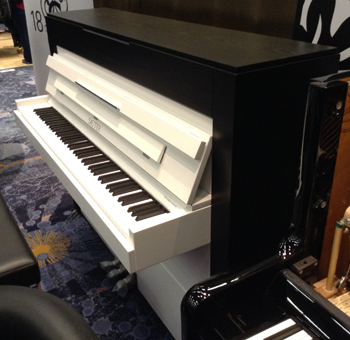 I’ll leave you with a piano that Yamaha displayed – an interesting and interactive piano. The purpose? Just to connect sound with visual. You can actually see the amplitude waves as you play. Such fun!